Finland is a beautiful country and there is something unique in this country. You have to discover it. There is no Acropolis, no great Pyramids, no Grand Canyon or Great Wall. There is the sound of silence and the eternal beauty of the forest and the lakes. And that before you even arrive in Lapland. Lapland is the absolute beauty of the ice fairies. It is nearly 20 years since the first time I landed in Finland and when I think of times that nature communicated with me, when I felt that I was part of earth, my mind always returns to Finland. And the people I met when I first arrived in Finland were another big part of Finland’s aura. Quietly friendly, clever, ready to approach, understand and befriend. The only thing you had to do was reach for them. You see the beauty of Finland stands in its aura and not in an Eiffel Tower or a Status of Liberty. That’s why my love for this northern European country is a personal matter. There is no tourist attraction in Lapland, you have to walk alone and discover the traces nature has left everywhere, and you have to walk half the way to understand how the Finnish people think. But that was 20 years ago. That was the Finland I fell in love with. Today something has changed. The nature hasn’t changed, it is just the same; the endless forests and the thousands lakes are the same. The people have changed. These quietly friendly people have become constantly defensive xenophobes and afraid. Afraid of something they don’t even know what. The truth is that a lot has changed in Finland since the late 1990s, and especially in the beginning of the 21st century. A country isolated, in the middle of two giants, from one side the mighty Russians and on the other the ready for war NATO, made them feel lonely. It also gave them a feeling of self-efficiency. A feeling that worked as motivation and defence. They learned to deal with everything, even with the mighty Russia, on their own. They learned to love the swamp under their feet and make it work for them. They farmed the ice and they succeeded. They learned that hard work rewards. Then came the fall of the Wall. Things changed fast and isolation ended. By the end of the 20th century Finland was a member of all major organizations and institutions and an equal member in the United Europe. The Finnish spirit seemed to triumph. A champion of human rights, a champion of equal rights, a champion in education, a champion in communications. Finland became a reference and Finns reached the peak of their pride. But the end of isolation brought some presents Finns were obviously not prepared for. It brought immigration, globalism, and antagonism. Suddenly the champion had strong competition and while still trying to keep the first place, pride became arrogance. Globalization, except the advance of sharing with a wider market, also brought sharing the problems of a wider market and finally immigration changed the Finnish population. From having an absolutely accountable population which let you predict and even adjust your education needs it came waves of immigration. The five million state in less than a decade increased by over 300,000 immigrants who brought with them new needs and a new realities. The multicultural world. A reality most of the other countries dealt with the last three and four decades. In a matter of few years some primary schools in Helsinki were found hosting nearly 20% with kids of foreign origins, a 10% of those not even speaking Finnish. In 2012 the xenophobic, racist, nationalist and basically fascist political party of the True Finns reached 19.1% of the Finnish voters. Ten years ago they nearly didn’t exist, they were nothing more than the trash in the background of the Finnish politics. Since 2012, one in five Finns openly declares that they are xenophobes, racists and nationalists. They believe that foreigners should not have the same rights as Finns, international or EU laws don't matter. One in five Finns openly believes that the Finnish welfare should only serve Finns, one in five Finns believes that media should be under control and promote Finland and Finnishism. One in five Finns consciously discriminates gays. One in five Finns opposes foreign aid or help to any international aid organizations. One in five Finns believes art should be Finn-centred to promote Finnishism. These are only a few examples of the True Finns beliefs that I can remember this moment. A True Finn member in the past suggested that all foreigners should wear distinctive marks (like a star?) on their clothes to separate them from the local population, another suggested limited access to educational institutes. Some of them have expressed their loyalty to Hitler’s ideals, a lot of them have openly expressed their fascist and Nazi faith. One in every five Finn in 2012 voted for them. But the rest of the parties, despite the pact they formed to oppose the rise of the True Finns, are not innocent. The Christian Democrats, with the very Christian outbursts of their leader Päivi Räsänen, have often competed with the True Finns in xenophobic and racist comments. She has occasionally even beaten them. The Centre Party (Keskusta) tries to be more politically correct, talking about controlled immigration, but they are equally xenophobic and they have shown it often. The Conservative Party (Kokoomus) is lost between a pro-EU rhetoric and xenophobic outcries from their voters’ pool. The Social Democrats try hard but separate members feel that a more anti-immigration rhetoric helps to collect votes, they often forget the party’s lines. The Greens, the Left alliance and the Finnish Communist Party must feel very lonely. And they are only something like 16-17% of the Finnish voters. The rest are trying not to be exactly like the True Finns. Because Finland changes in a True Finnish way. Whatever anybody try to tell me I actually witnessed the change. I saw the fear increase, I heard the xenophobic comments everywhere around me and the last two years I lived in Finland I often felt not welcome. In the beginning it was not personal but that changed fast. While in the beginning it was “some foreigners” soon it became, “why you live here? Do you have a job or you live on the state’s money.” You see soon every foreign had immigrated to Finland because of the champion welfare state, to live without work on the money of the Finnish taxpayer. For me as a Greek, things turned even worse. I was responsible for the bankruptcy in Greece because I was lazy and never paid my taxes and I should be punished because Finns have to pay for the bailout of Greece. Still what I saw and went through was absolutely nothing compared to what some friends from Somalia or Nigeria went through. And please don’t get me started on the Iraqi, Iranian or Afghan immigrants. Indians and Asians, nobody was an exception. One thing xenophobes and racists never do is discriminate who they hate. Many often questioned themselves if it would be better to be in their tortured from war countries. That while unemployment among foreigners in Finland reached 75%. This has absolutely nothing to do with education, training or experience. I can tell you from experience, it has only to do with the fact that you are a foreigner. And they managed to point out that it doesn’t matter where you went or what you did. 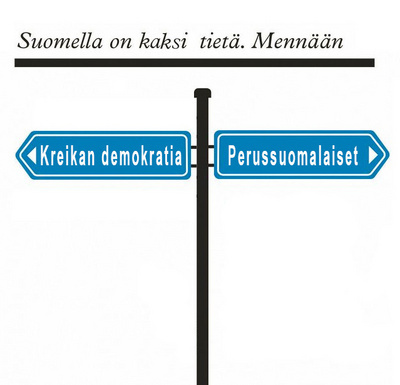 The Finland of 2015 has nothing to do with the country I first encountered in the 1990s. It is a country full of fear for the lost glories and myths that has turned it into a country of revengeful xenophobia and racism. 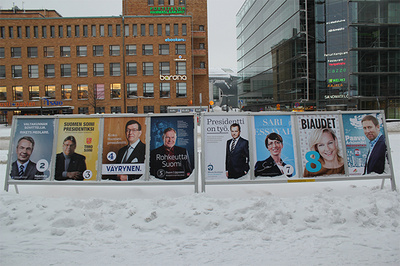 Tomorrow, on the 19th of April 2015, Finns are going to vote for a new goverment, perhaps a new Prime Minister. It doesn’t matter who is going to win, if it is the Centre Party or the Social democrats, what really matters is the day after. It is the day when the Finns decide if they like their new True Finn transformation. This is what they have to decide while they vote. If they want to go to sleep in a country that champions human rights and wake up in a country of the True Finns, regardless of the percentage the True Finns Party will get.